Vale's Coleman mine recently received two battery-powered Artisan A4 load-haul-dumps (LHDs) equipped for AFEX fire suppression systems for a six month trial. The A4 is powered by a lithium battery that provides four hours of operation on a one hour charge. 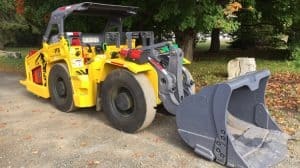 Vale intends to pursue battery-powered vehicles for it's underground mines across Canada when it's sure the technology will meet their needs and make economic sense. The goal is to reduce ventilation needs, and their associated costs, while also staying carbon neutral. See here for more information on the A4 and Vale's plans.